I received a review copy of E:C through Alex at Logic Artists (full disclosure: a free copy) two weeks prior to the release of the game. That Friday had been hell and by the time I had trudged home from the office I wanted to lie down and sleep through the rest of the weekend, however, that was not to be. Seeing the steam key in my email lit up my evening and I immediately installed the game. Some fifty-six hours of near continuous play later, I had finished my first complete campaign and was ready to jump into another and see it all again. In order that one might explain how and why the game was so engaging, so engrossing and so thoroughly compelling, it is best to start at the beginning. The first thing that the player should notice is the music. The backing track as the game runs through its loading sequence is minimal, Spanish guitar accompanied by drums. It recalls Neil Young’s ‘Dead Man’ soundtrack—it sets the tone and pitch of the game, while remaining entirely unobtrusive. This stylised soundtrack will accompany the player throughout the game, varying depending on particular circumstances of play (exploration, combat, etc.) Once at the menu screen, I explored the graphical and gameplay settings. The range of graphical settings are varied, and the game supports 1920x1280 resolution, which came as a pleasant surprise. The gameplay settings are what really shone through, however, as I was presented with a panoply of adjustable sliders and multipliers which have an observable effect in play. The named difficulty settings (Cortés (normal), Pizarro (hard), and Aguirre (insane)) also go a long way to set the tone of the game. As Capitán, you along with your band of Conquistadores(accompanied also by your encomienda of servants and slaves) must follow in the footsteps of these men, or alternatively, make your own history. The game includes an iron-man mode, however, I did not use it in the process of writing this review. 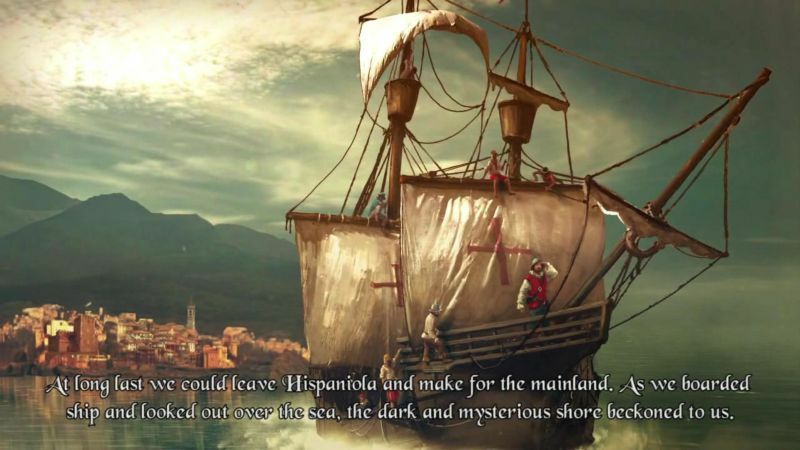 Once you start a new game, you are presented with only the option to choose the Hispaniola campaign (Mexico remains locked regardless of whether or not you’ve previously completed the game at this time, and unlocks during play). This is followed by chargen in which you roll up the “player-character,” the expedition’s Capitán. 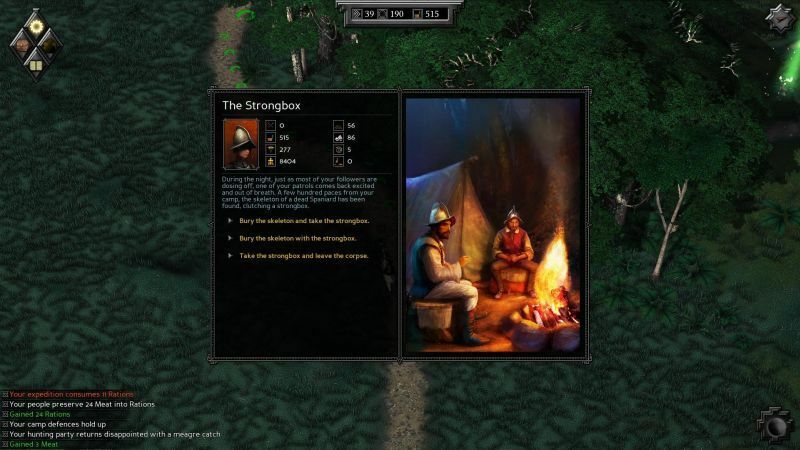 Players have the choice to distribute skills between tactics, diplomacy, hunting, scouting, medicine and leadership, all of which effect in-game events both random and story-based. You are given the choice to play either gender[‡], and to decide on a name for your character (my own was Isidoro Aragonés). Unfortunately there is only a choice between one portrait for each male or female. While some variety would have been preferable, it’s a trifling concern. Having now rolled up your ‘PC,’ you’re given your choice of up to eight companions of assorted professions (doctor, hunter, scholar, scout, soldier), all of whom influence your own abilities as they contribute their knowledge to your own. Further, each companion has specific traits which determine how they will react to choices made by the Capitán during the course of your expedition. [§] Your party can be supplemented by quest-related, and recruitable companions once your journey is underway. So here we stand, on the shores of Hispaniola (modern day Dominican Republic/Haiti), far from la patria, and with a world of possibilities open before us. At this point, you might wonder how the game introduces itself to the new player and teaches you to navigate its systems—unless they have been disabled in the gameplay options, as you progress through your first game, tutorial tool-tips will pop up as they become contextually relevant. These tool-tips were an excellent guide, but just that, a guide to the game’s systems which did not seek to hand-hold the uninitiated through the game. There is much in this land that you will have to learn for yourself. E:C deploys a tried and true narrative trope to thrust the player into the intrigues of its game-world. Having arrived on Hispaniola, your ship is confiscated and your crew sequestered by the royal governor. It seems he’s got a problem with the natives (who doesn’t? they’re revolting, well, them and the rebels, of course) and you’re the man (or woman) who can take care of it for him. One task completed, another threat raises its head, and the poor Capitán is still beholden to the governor. Thus, the player is embroiled in a civil war between the rebels and the crown, as well as between the rebels themselves. The structure of quests offered on Hispaniola is homologous with any low-level campaign setting, they are introductory, and lack structural depth. The player has no real choice whether to aid the governor or side with the rebels, nor does s/he command much agency beyond the order in which tasks are completed, and how much exploration and additional content to explore while undertaking the over-arching introductory quests. While some may bristle against this lack of initial freedom, the narrative in which the quests are framed (regardless its vintage), and the quality of writing and gameplay should be more than enough to propel the player further into the world and on to the shores of Mexico. At this point, I am going to change tack and address individual themes, firstly, the gameplay mechanics. E:C is a turn-based roleplaying strategy game, which includes elements of exploration, resource management, adventure, and roleplaying. The player explores and discovers the “new world,” and the “Seven Cities of Gold,” (or so the Spanish believed) in a turn-based mode which reflects the possible distance the party can travel on a given day, on an overland map. Your navigation is aided by a compass, which remains purely stationery (sorry, Skyway no quest compass for you), and an in-game map which reveals the territory of the new world as you discover it. The player can discover native ritual sites, villages, cities, random encounters, abandoned temples, and maybe even beings of myth and legend if they search long enough and hard enough. Exploration on the overland map is rewarding, and long treks through dense jungle, arid, volcanic terrain, abundant coast, or impassable mountain ranges is kept fresh by the presence of wild pigs, native medicinal herbs and abandoned Spanish equipment, all of which are randomised and replenished after a number of days. The player guides his party through these varied terrains, and in the process must be aware of his/her location on the map in relation to sites of interest which appear as you draw closer, while at the same time you must also keep your rations, medical supplies and military equipment in check. Should you set off into the jungle undersupplied or without enough medicine, you may not be able to return without having lost a member of the expedition. This leads neatly into the resource management aspect of the game. The player is tasked with managing and assigning rations, medicine (through doctors), and equipment to his/her companions. All three can be acquired on the overland map, and as rewards for quests, exploration and for completing random adventure-style events. Managing these resources requires the player to offset their contextual use, as well as their theft or loss during the expedition, against acquiring enough of them to supply the party. At the end of each day (represented by the exhaustion of the player’s movement points on the overland map) the party must camp, during which time it is possible to assign rations, tasks (hunting, tinkering, patrolling, guarding) to your followers, as well as to use your doctors to heal injured companions. During the night the game simulates a number of random events based on your party’s skills in guarding (i.e. fending off wild animals), patrolling (i.e. your scouts finding an abandoned hut), and hunting (i.e. your hunters trapping game); based on these events the player starts each day either making a net gain or loss of various resources, which effect his/her decisions at the end of the next day. The most vital resource comes in the form of valuables, which is both the currency of the world and one of the markers of a successful plundering expedition when you return to the court in Spain. Second to your accumulation of capital, is your ability to equip your troops. Equipment must be distributed among your soldiers as required and on their inventory screen can be assigned as melee, armour and ranged. The better equipped your conquistadors, the more likely they are to succeed in combat—should they fall in battle, however, they may lose equipment in the process. At no point did resource management in E:C become a trifle, even when fully supplied with rations, medicine and equipment, I find that I could rarely gather enough valuables for the glory of Spain, even after going to tremendous lengths to persuade the natives to part with their own. Thus, the game’s economy is not simply one of quest reward-in, money out, better equipment in; but rather asks that the player strike a balance between throwing away valuables to win this fight, and keeping in mind that you must retain enough to take back home at the end of it all. It should be noted that it becomes possible later in the game to store all party resources if you have a surplus. Crafting is another important element of the game which ties to resource management and exploration. In the abandoned equipment crates scattered throughout the world, you will find secondary resources: oil, wood, rope, etc. Depending on the difficulty, these will be abundant or scarce. These are used to craft a panoply of combat aids from traps, to barricades. Crafting is highly useful, and certain fights are made much easier with a few carefully erected barricades and scattered caltrops to slow the enemy. Additionally, the crafting screen (only accessible to scholars, or characters with the tinkering skill) has an invention tab, which allows the player to research improved travel and resource gathering tools. Personally, I recommend researching carts as soon as possible for the increase to maximum movement. E:C’s adventure and questing mechanics owe much to games such as Darklands, and I’m told, Kings Bounty. When investigating a quest marker on the overland map, the player is presented with an “event window,” in which the context and narrative of the event unfolds. In most cases, the player is presented with the choice of how to approach or complete the quest, often based on root abilities (tactics, diplomacy, medicine, and so on) and dependent on the player’s skill level. These choices do not scale do your level, and if a player with poor diplomatic skills attempts to negotiate, haggle, cajole, or otherwise talk his way out of a fight or into a greater reward, s/he is likely to fail. These adventure-style quests and events are one aspect which set E:C apart as an excellent roleplaying game—they demand only that the player play to his/her character’s strengths and shape the narrative around that engagement. Many quests can be resolved by the player through these adventure sequences, especially if playing as a diplomat. There are often multiple solutions, depending on the context. One example might be the choice of whether to kill rebelling slaves, kill everyone (even those who did not rebel), or to allow survivors to go free. Each choice will result in a variable reward and some companions will lose or gain morale depending on their traits; some may even interject with their opinion or protestations. Many events, regardless of your skills, will, however, end in combat. This is the price paid by the shining lords when encountering the queer and alien peoples of the new world, savages who know not even the word of God. This, of course, brings me to what you’ve all been waiting for: THE COMBAT. E:C’s combat system is hex-based and turn-based. 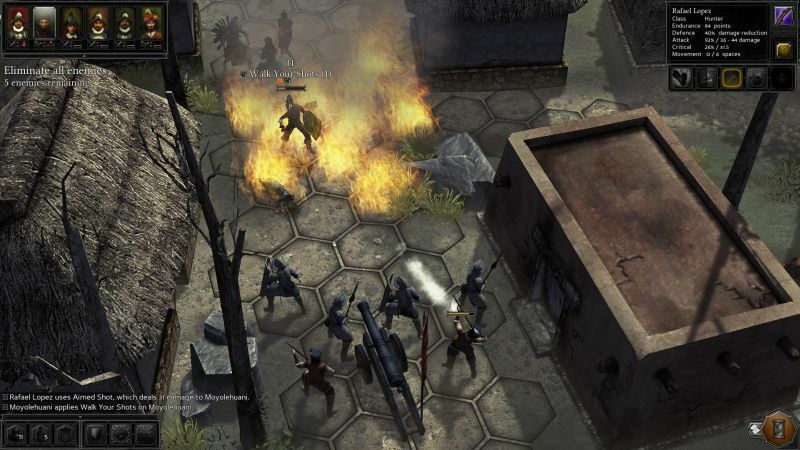 The player character does not enter combat him/herself, but rather manages a party of up to six companions as in a roleplaying-strategy such as Jagged Alliance II. The combat lacks many of the sophisticated systems of a turn-based titan like JAII, but that is not to denigrate E:C. What is on offer is a feast for the turn-based aficionado. As your companions level up they will unlock active and passive combat abilities, and access to higher grades of equipment. Once in combat, each member of the expedition plays a specific, tactical role: the soldier is a slow-moving (represented by less movement points/range of moment on the hex-grid) highly armoured tank; the scout is a glass-cannon, capable of sneaking around behind an enemy to flank or backstab, moving great distances; the hunter is the ranged specialist with either bow or arquebus; the scholar provides the party with buffs (through tactical cohesion) or the enemy with debuffs (by distracting them with the word of the one true God); and last, but not least, the doctor acts as healer and reviver. In addition to your Spanish companions, you may have native companions, such as warriors, trackers or shaman, who perform roles analogous to those of your good Christian soldiers. Throughout the game, you’ll combat an array of foes: Aztec, Totonac, Spanish, Mayan, Carib and Taíno. The combat map requires that the player be clever in positioning his/her troops in order to minimise ranged damage taken, to funnel the enemy into choke points, and to cut off access to the player’s own ranged units. There are several different combat modes on offer, from survival (survive ten turns against hard odds), to cutting off an enemy’s retreat (prevent enemies from reaching an escape zone), escaping an enemy yourself, and of course, straight up melee. As I mentioned above, the player is able to deploy a number of aids in combat—barricades and traps—which give the player an advantage in directing the flow of enemy movement; beware, however, that the enemy can sometimes employ these same tricks. The combat AI has been, in my experience, very good if not excellent. The enemy will attempt to flank your position; they will focus fire on a weakened, cursed or poisoned companion; they will make a bee-line for unprotected ranged units, or undefended zones which would allow them to outmanoeuvre the player. Occasionally, they will suffer a bout of stupidity, and charge straight for the player, usually falling in the process, but overall the AI is intelligent and solid and on harder difficulties provides a firm tactical challenge which can easily stop the unprepared player in his/her tracks. During combat the player’s followers may incur injuries, which can be minor or life threatening depending on the situation. The longer a follower remains incapacitated on the battlefield, the more grievous the injury, and if a doctor has not accompanied you on the field, that injury must be healed while camping, adding a vital link between combat and the exploration-resource management aspect of the game. It should already be apparent to the reader that E:C is set against the backdrop of the Spanish invasion and conquest of the Aztec Empire, and the nascence of European colonialism. Some might conjecture that E:C is, therefore, a white guilt simulator, but I can honestly say that I felt no guilt whatsoever as I drove the savage hordes before me and remade Tenochtitlan into a house of God. As a narrative frame, the colonial period has fallen out of favour for obvious reasons, however, it has also been the foundation for brilliant works of literature (Conrad’s Heart of Darkness; Marguerite Duras’ L’Amant, and Shakespeare’s The Tempest) and film (Werner Herzog’s Aguirre, der Zorn Gottes ). The colonial period and the European colonisation of the Indies has not been totally neglected in video games, there are titles such as Sid Meier’s Colonisation , and the execrable Age of Empires III  which have dealt with the setting and its themes. It is in the mould of the former, however, that the theme has most often been explored—on the macro scale. On the scale of real time, or turn based historical strategy there is little room for the player to contemplate or truly engage with the setting and what his/her agency in this world means. This is one of the benefits of the scale offered by E:C. The player’s journey is undertaken at the personal level, as s/he must either follow in the footsteps of historical colonialists (Cortés, Pizarro, Aguirre) or remake history as they so desire. This may raise concerns of revision, but Logic Artists has not pulled any punches. On the one hand, the world is vibrant and alive, it is a new world of new possibilities, both for (wo)men to make themselves and to remake the world in their image; it is also a world in terminal decay and decline. The Aztec Empire (themselves a brutal colonial power, for any of you who think the Spanish were the first to subjugate the Nahua peoples) cannot sustain itself economically, its vassals and subjects are in a state of rebellion, and the newly arrived Europeans have brought pestilence and warfare to their shores. The player is cast into the middle of a socio-political conflict between a subject people and their masters, and must necessarily influence its outcome. This is not to say that the player acts as omnipotent European, intervening to solve the petty problems of the natives, and this is where the Logic Artists have done real justice to the setting while remaining sanguine vis-à-vis historical revisionism: both the Tlaxcalan and Aztec leaders wish to use the Spanish to achieve their own political ends, they have just as much agency in this conflict as do their Spanish allies (or enemies). Thus, the setting is not merely an exotic backdrop for a roleplaying adventure, but one brimming with alternative historical possibilities (although what alternative can their really be once the first encounter of these peoples has been made, they needs must undergo radical changes on both sides). The Logic Artists have, further, paid incredibly close attention to the mythology and history of the Aztec Empire and the Nahua peoples of Mexico. The game world is infused with references to native practices, and in several cases foregrounds the myths and beliefs of these peoples, either implicitly or explicitly. In the latter case, the player can view a Codex Historiae, cataloguing the context of the setting for those who have a keener interest in it, while in the former case, the player can discover temples, cults, and undertake quests which communicate an incredible depth of engagement with the setting on the part of the developers. Let no (wo)man accuse ironyuri of being a graphics whore, but E:C is a beautiful game. At 1920x1280 resolution and on maximum graphical settings, the world looks absolutely amazing. The camera is angled top down on the overland map, and isometric on the combat map. It is entirely possible to zoom in and out, which shows the richness and depth of detail both in the map design, as well as the appearance of the characters. In terms of aesthetics, the artistic direction of E:C is cohesive and consistent. Aztec warriors can be readily differentiated from warriors of more primitive tribal groups by their elaborate armour and weapons, while each type of Spanish companion has their own appearance in game. The armour and weapons are beautifully designed, and the overland map, as well as the world map which can be opened with the ‘m’ key are stunning to look at and highly detailed. Perhaps most remarkable is the city of Tenochtitlan, which although appearing diminutive due to the grand scale of the overland map, looks like a monumental city, the heart of an Empire. There is of course one city on the map which rivals the city of Tenochtitlan in its opulence, if not its population. For those lucky enough to find this lost city, I imagine they too will be blown away by it. During my reviewing of the game, I did encounter a number of bugs. Some humorous, some frustrating. For several days while getting to grips with the game, I was in constant email correspondence with Alex from Logic Artists, reporting bugs and giving feedback on problems that I had encountered. His replies were prompt, and always courteous. He referred the bugs I encountered to the programmers, and in the two weeks leading up to release I counted at least six patches to the game on Steam. The Logic Artists are obviously dedicated to making this a wonderful game, and while some bugs will leave players frustrated, most can be fixed by saving, quitting out of the game and firing it back up, or alternatively, with a few deft console commands. To give a final overview of E:C is difficult, but I would sum the game up as a crowning first achievement for the Logic Artists. With a meagre budget, they have brought to our hard-drives a roleplaying-strategy-adventure hybrid which cribs from all the best of those genres. I found the turn-based combat compelling, and rarely boring. Each battle was a chance to test new tactical permutations, and because of the injuries your followers might incur in combat, I was often forced to use different combinations of followers in different fights. The resource management and exploration systems reward the player for engaging with the game world, and provide a steady challenge to navigating and discovering these foreign lands. The over-arching narrative which communicates all the themes of the early colonial project—discovery, civilisation, proselytization, conflict, transformation, and adventure—is thoroughly engaging, and offers at minimum, two complete playthroughs of the Hispaniola—Mexico campaign. A complete run of an entire campaign takes about 30-35 hours in total, and I would argue that the structure of the campaigns is similar to a Pen & Paper progression, in which Hispaniola is the low-level (1-3) campaign in which you kit out your party and begin to improve their skills, while Mexico is a targeted at the medium levels (3-5), in which the party is already capable and must now put its capabilities to the test. Overall, E:C is an excellent addition to the pantheon of turn-based cRPG hybrids, which stays true to the traditions of its forebears, while offering something fresh and exciting. I, for one, would dearly love to see E:C get the proposed Peru-Inca campaign expansion that was originally proposed as a stretch goal during the crowdfunding campaign. [*] I have not named the website which hosted the campaign as that would entail advertising. [†] I should make it clear at this point that I was not a backer of Logic Artists’ crowd-funding campaign, but rather a fellow-traveller. [§] Full disclosure: I totally have a crush on Juan Ortega. [¤] Note: The Codex does not believe in numeric scores as an expression of qualitative function. The above joke is purely an expression of the author's own tasteless attempt at humor.